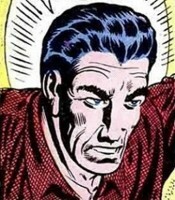 Powers/Abilities: Jeff Raye was an inventive genius who created a matter transporter machine that generated a space warp which temporarily transported him to a world in another galaxy. History: (Strange Tales I#67) - After successfully transporting his cat, Butch, on a short test trip with a smaller version of his matter transporter machine, Jeff Raye began work on a larger version of the transporter; he planned to set up a receiving unit about 200 miles away. As Jeff was working on the machine, Butch swatted at a fly and stepped on the transporter's activation switch. Jeff found himself transported through space to the planet of the war-like Rojans in a distant galaxy. He partially materialized in an alien laboratory where (as fate would have it) the Rojan scientist Noki was apparently conducting a similar experiment for the Rojan leader, and Noki's device acted as a receiving station for Jeff's signal. 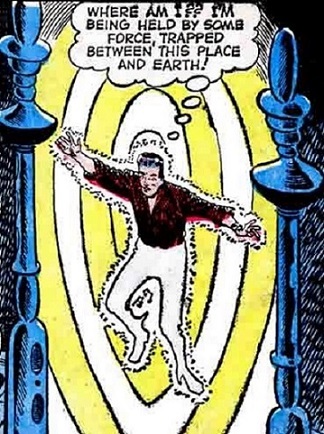 Suspended in mid-air between two energy poles and trapped between two worlds, Jeff sensed (as the two Rojans communicated with him telepathically) that the Rojan leader wanted to learn the secrets of his transporter to use for an invasion. The Rojan leader and Noki used a thought-recorder on the trapped Jeff to record all his knowledge on a tape, then they took the tape away to process. Seeing an exposed electrical grid on one of the energy poles, Jeff formulated a plan to escape. He threw some of the things he had on him -- a pen, a pencil, and a wristwatch -- at the grid in order to short it out. He finally hit the grid on the third try with his wristwatch, and cut off the power that trapped him. Fully materialized and free in Noki's lab, Jeff found the two Rojans and retrieved the tape with the secrets of his matter transporter on it. 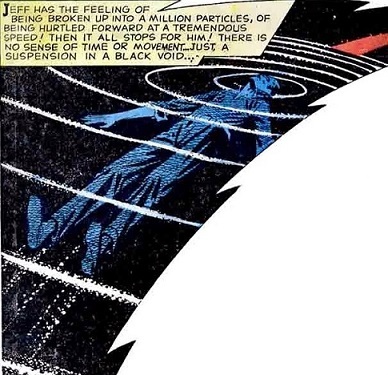 Jeff then ran back to Noki's own matter transporter, turned the power on to maximum, and jumped back in the space warp, just as the transporter exploded. Jeff once again found himself transported on a return trip back to Earth. Arriving back in his lab, he vowed to take the secret of the matter transporter to his grave; then he took a crowbar and smashed his transporter machine so it could never be used by alien invaders again, all while the curious Butch just watched. Jeff Raye's pet, he was used by Raye as a test subject when Raye experimented with a smaller version of the matter transporter. Butch returned the "favor" when he sent his owner on a trip to another galaxy by accidentally stepping on the activation switch of Raye's larger matter transporter while Raye was working on it (...or maybe it was on purpose -- you know how cats are). An aggressive militaristic race of orange-skinned, humanoid-like aliens, they lived in a distant galaxy. They communicated with each other by mental telepathy. Noki (the Rojans' greatest scientist) was apparently demonstrating his own version of a matter transporter to the Rojan leader when Jeff Raye partially materialized in his laboratory. The leader wanted to use the matter transporter to invade other worlds, so they used a thought-recorder device to learn the secrets of Raye's machine and use it as a receiving station. They recorded Raye's thoughts on a tape, but Raye escaped and took the tape before they could process it.